Opel RAK e review | What Car? What is it? The RAK e is an experimental electric tandem two-seater. It has a top speed of 75mph, will travel more than 60 miles on a charge and is being seriously considered for production by Vauxhall. It wears the badges of Vauxhalls sister brand Opel, and its curious name was inspired by experimental cars developed in the 1920s one of them rocket-powered. The RAK e, however, is propelled by a 49bhp electric motor, and therefore has zero emissions. What's more, Vauxhall reckons its running costs would be around a tenth of a small hatchback's. A mix of car, bike and glider, the narrow, ultra-aerodynamic RAK e is built around a robust steel frame, to which plastic panels are attached. Its canopy hinges forwards to allow access to the cabin. Legally, it qualifies as a quadricycle, but it has most of the safety features of a car, including a rigid safety cell, anti-lock brakes and stability control. Its electric motor drives rear wheels that are hung from a motorcycle-style swing-arm, while the double wishbone front suspension is similar to a racing cars. Clever design keeps the RAK e light, to maximise performance and range, and the use of mainstream materials means that it should be inexpensive to build and repair. Whats it like to drive? Climbing aboard is simple, aided by the fact that the steering wheel and its column lift out of the way. The RAK e is easy to drive, too, with a simple rocker-switch providing forward, reverse and neutral gear positions, and two pedals are arranged either side of the steering column like a go-kart, so that you brake with your left foot. The seats are fixed: instead the pedals and steering wheel slide back and forth. With drive engaged you simply press the accelerator and whirr away rather noisily because this concept car has no sound-proofing. It doesnt take long to see how wieldy this slender little car would be in a city, and how much fun it might be on country roads. It wasn't originally intended as a sporty car, but when Vauxhalls engineers started to drive prototypes they rapidly realised that it could double as a modestly powered zero-emissions fun vehicle, as well as a commuter tool. True, the steering of this concept version is a little slow-witted, and the car isn't very fast. This one was built merely to drive onto a motor show stand, however, and its potential is obvious. Whats it like inside? Stepping inside the RAK e is a bit like stepping into a bizarrely padded bath. The first time that big canopy drops around you it can feel slightly claustrophobic. However, those feelings evaporate once youre enjoying the panoramic vista through the wraparound screen. A single electronic screen at the base of the canopy provides a digital speedometer, an econometer and a battery charge meter. Meanwhile, a smartphone mounted to your right provides navigation, communication and, when youre out of the car, the facility to check the batterys charge and trigger the seat heaters while its still connected to the mains. Theres no air-conditioning in the RAK-e. Instead, the canopy rises slightly for a through-flow of ventilating air unlike Renaults Twizy, the RAK e is fully weatherproofed. Sitting in the rear is adequately comfortable, if confined, and almost as intimate as riding pillion on a motorbike. Should I buy one? 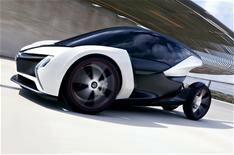 You cant buy one yet, but Vauxhall is seriously considering production of this radical electric city car. The car itself is close to being finished, and Vauxhall/Opel is now working out how best to produce it. With a projected entry point of around 8500 the RAK e could make real sense as a commuter vehicle. Better still, it promises to be fun to drive and vastly more exciting than your average hatchback. Heres hoping that Vauxhall has the nerve to build it.